T&G Construction | ... Quality construction for exquisite homes. I thought it might be useful for prospective clients to read about out what a typical renovation looks like, so I am creating this narrative and timeline to illustrate the sequence of a remodel. This could be a kitchen remodel or an addition to an existing home or the like. Every project starts with planning, and I always recommend to my clients that they "front load" this part of the project in order to avoid surprises and costly delays while the work is underway. This process can take a year, sometimes less. You will sit down with your designer and hammer out the overall scope of the job and fill in all the details. Building and zoning permits have to be secured and sometimes take months before they're approved. It helps to have another professional involved in this process: The contractor! I often advise clients and architects on how much a given project may end up costing by producing a preliminary estimate which is based on the square footage of the architect's preliminary design and what similar projects have cost in the past. In some cases the desired scope of work cannot be realized given the budget at hand. Knowing the approximate cost of things helps to avoid having the architect design aspects of the job which may bring the project "over budget" and may therefore never be built. Eventually the scope of work will have been hammered out and now the architect can produce the "construction set" of drawings and apply for the building permit. With this set of drawings I can put together a researched pricing proposal. This will contain line items stipulating subcontractor's and material costs and what tasks my company will accomplish and the associated costs. If this is acceptable to you as the client, then we will sign the construction agreement and set a starting date for the work to begin. The construction contract can be structured in one of these three ways: 1) It can be on a fixed bid - All the work drawn on the plans will be performed for a set amount of Dollars. This may seem like a good idea at first but the fact of life of a construction project is that there will be change orders; for example: sometimes when opening an old wall deficiencies are found which need to be repaired and compensated for in addition to the anticipated work. 2) We can enter into a "Cost Plus" agreement - Where I research all of the costs to be expected to do the work, such as all materials and subcontractor's prices, add the amount for what my company will accomplish and add a margin for overhead and profit. This provides a more flexible framework to work under and additional challenges can be more easily dealt with. 3) The work can be done on a "Time and Materials" basis - Here you agree to pay only for the actual costs of the job as they occur measured by hours worked by everyone on the project plus the materials purchased, plus the sub's costs and a margin for overhead and profit. This makes sense for smaller projects where a tight budget is not the driver. It is also most fair to everyone - You pay only for the work done and everyone gets paid for what they do. Along with the proposal I furnish a construction schedule which details what tasks are happening at what point in time, so that everyone involved in the project - The client, subcontractors and workers, all know what has to happen and when a particular aspect of the job is expected to be finished. We have successfully delivered many construction projects to our clients. We perform New Construction, Residential & Commercial Remodels, Bathroom & Kitchen Remodels, and all Interior and Exterior Improvements. Below are just a few of our recent success stories. We completed restoring this gorgeous “Old Lady” to her former glory and added a stylish modern apartment in the basement. 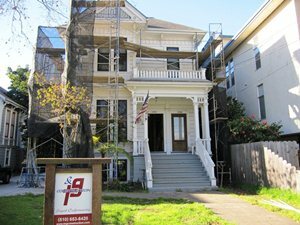 This is a beautiful three story Victorian in the city of Alameda. We took over this very complex project where recently a remodel had been started, but had been left in its rough stage. The family has owned this building since the 1940's. From the beginning it was clear that the existing plans and permits were not suited for the outcome desired by the owners. We had our friend the architect draw up new plans in CAD format. These went through the city planning and building departments.The planning department approved to convert this property into a legal duplex. We completed the framing, rough electrical, rough plumbing and heating, which in this case is of the hydronic type: Plastic pipes in the floors circulate hot water to do the heating. We went through all the stages from drywall to cabinetry, tilework and painting to final inspection. The exterior painting was done complete with multi color scheme and gold leaf accents. The interior was renovated to the owners specifications and to their contentment. We are very proud of the fact that we were able to turn this project around and achieve an absolutely positive result. The owners are very happy to have their family home back. A great Example where efficiency, form and function all come together in this beautiful backyard cottage. When Karen, a planning professor from the College of Environmental Design, met with a team of students from Dr. Ashok Gadgil’s Design for Sustainable Communities course, neither knew what was brewing. Karen discussed how her two bedroom Berkeley home was too small for her constant stream of guests, her daughter and an aging relative. The team of students was researching small homes as a means to create affordable and sustainable housing. 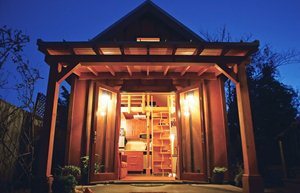 The result was a net zero energy backyard cottage, a new model for shared affordable housing, a Clinton Global Initiative grant and a new Berkeley startup. Read an interesting article in the Washington Post by clicking here. Read another article in the San Francisco Chronicle by clicking here. Read yet another article that appeared in Time magazine by clicking here.